A victorious post-bailout Alexis Tsipras, a defiant Viktor Orbán backed by far-right colleagues and an exhausted Jean-Claude Juncker. This week’s EP plenary showed, even more than Juncker’s tired annual address, what the actual state of the Union is and the contradictions Europe is facing. When Tsipras took office in early 2015, many worried if the new Greek government was a threat to the very existence of the EU, or at least to the eurozone. Now Tsipras no longer looks so scary, Syriza is closer to social-democracy than to the far-left and Athens has become an ally, rather than enemy, of the institutions. “The real threats are the forces that want to kill Europe, not the forces that want to change Europe,” Tsipras told reporters after his speech on future of Europe in Strasbourg. While Europe was looking at Greece, far-right Eurosceptic forces were on the rise in a dozen EU countries. Some are already in office, contesting the core values of the Union not only with words but with actions. On Wednesday, Parliament debated a report that called for the activation of Article 7 against Hungary because of “a clear risk of a serious breach” of the rule of law in the country. Orbán took the floor, arguing that he was being attacked for opposing EU migration policy, and even that it was his whole nation, rather than his government, that was under attack. Instead of signalling that anti-democratic behaviour and hate speech will not be tolerated, the debate turned out to be the perfect platform for far-right political parties to spread their messages. Some of the most prominent far-right leaders in Europe, Nigel Farage in the UK, Marine Le Pen in France or Matteo Salvini in Italy, have over the years used Parliament to build their career and spread rightist ideas. 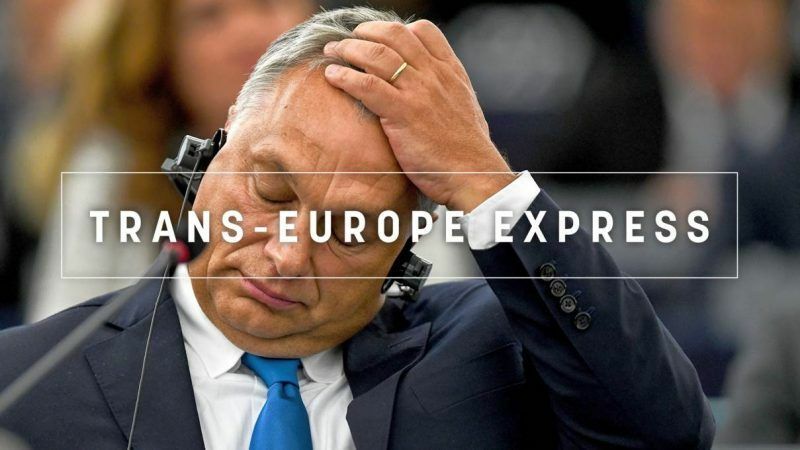 Parliament largely voted in favour of triggering the so-called ‘nuclear option’ against Hungary, but the European People’s Party –to which Fidesz still belongs- was divided. Its leader, Manfred Weber, admitted they were unable to agree on a common position ahead of the vote. “Do you want to know why populists are getting stronger? Because part of the traditional parties is using the same arguments and explanations,” Juncker said in an interview. While the EPP seems to be heading for a major crisis due to its inability to curb increasing tolerance towards far-right tendencies among its members, the social-democrats have been sliding in polls for years. But recent development in Sweden and Spain could change that. It is not a secret that Syriza, which currently belongs to the United Left in Parliament, has been mingling with social-democrats at party summits ahead of European Council meetings. S&D chief Udo Bullmann, took the opportunity to invite Tsipras to join forces with Spain and Portugal, as well as the Italians, and form a Mediterranean alliance. An alliance, Spanish S&D MEP Iratxe García told EURACTIV, that might not necessarily be electoral but would cooperate in specific areas where the Mediterranean countries have common positions. The Mediterranean alliance is not the only one that came up in the plenary. Liberals leader Guy Verhofstadt blamed the EPP for their incapacity -or unwillingness- to stop Orbán and said they have lost “the moral authority to lead Europe”. Of course, he presented the alternative: the liberals as the “movement” to help Europe open another chapter, built on Juncker’s legacy. A new and alternative Europe that, he said, could start by taking in the ideas presented by President Emmanuel Macron. It is no coincidence that he declared this the same week that reports emerge about his talks with Macron, Europe’s new golden boy, on joining forces ahead of the European elections. ‘Shining example’. As the first anniversary of the declaration of independence of Catalonia approaches, Spain’s foreign minister wants to be more active in shaping the international perception of Spain. Moria ‘hotspot’. Greece’s biggest migrant camp faces closure next month unless authorities clean up “uncontrollable amounts of waste”, the regional governor said, citing public health risks. Money for peace. Northern Ireland is viewed as an example of the success of the EU’s cohesion policy. But as Brexit draws nearer, EU project funds in the region to preserve peace are in jeopardy. Joining the club? Croatia could join the eurozone within four years if the government submits an application and all goes well in the so-called ‘euro waiting room’. Is the country ready? Friendly gesture. Bulgaria and Croatia should join the EU’s passport-free Schengen area immediately, EPP group leader Manfred Weber said this week raising the country’s hopes for green light. Canvassing Babiš. Czech MEPs want to take the prime minister’s fraud case to the next level and urged the Commission to investigate for possible conflicts of interest involving EU funds. In the same boat. Budapest joined Warsaw in being subject to Article 7 proceedings that will examine the threat of a serious breach to the EU’s core values. Golden visas. Hungary is also in the line of fire as it has sold visas to Russian businessmen and people covered by European sanctions in exchange for big money. Election deadlock. Sweden faces a political impasse after far-right election gains could make a coalition building mission impossible. Juncker rewind. Did you miss our coverage of the State of the Union? Where were you?! You’re forgiven because you can catch up on it all with our ‘As it happened’.